At the beginning of January there were no Class 27s under repair at Derby Works. During 1970 EQ brakes were fitted to Class 27 locomotives at Glasgow Works, five of the ex-LMR Class 27s had been so equipped by Derby Works. Further news about improvements for the Edinburgh - Glasgow route suggested hauled stock with a Type 2 at each end, with modification to permit 100 mph running. Transferred from the Nottingham Division to Eastfield during February were 5371/76/81/84/85. These transfers left just 5377 & 5388 allocated to the Nottingham Division, they would be transferred to Eastfield during March, again Class 20s from Scotland were sent south in replacement of the Class 27s. During February 5437/48 moved to Haymarket, the first Class 27s to be allocated there. The influx of ex-LMR Class 27s to Eastfield allowed the Class 27s to become firmly entrenched on the Glasgow - Dundee services. 5345 sustained fire damage on March 30th whilst working the 09.45 Glasgow - Inverness with 5332. 5345 was later dumped in Ballinluig loop, whilst Inverness was reached 150 minutes late with 5308 assisting. at about the same time Glasgow Works held damaged 5317/28/82 in various states of repair. During 1970 work commenced on converting 24 Class 27s for use on the Glasgow - Edinburgh push-pull service. All of the batch selected were boiler equipped, with the exception of 5374, which was then fitted with a Stone-Vapor boiler. Fuel capacity was increased from 500 gallons to 685 gallons. The locomotives would be renumber to 27101 - 27124. The passengers on the 23.45 Edinburgh - Birmingham of June 23rd probably wished for something reliable after 5324 set fire to itself at Slateford. 5325 was noted fire damaged at Haymarket during September. As part of the lead-up to the push-pull service 5413 was sent to Derby Works for attention, including the fitting of dual brakes. By October 5409/13 were present at Derby. On August 15th a derailment at Kirkconnel closed the GSW route with services being diverted via Beattock. A Kingmoor dmu and 5386 with three coaches maintained the local service between Kirkconnel and Carlisle. Diverted trains included 5209 & 5202 on 1S28 Blackpool - Glasgow, later returning light and 7634 & 7671 on 1S54 Blackpool - Glasgow service. On October 5th a landslide near Tyndrum derailed and rolled 5381 onto its side whilst working a freight on the Oban line. Just over a month later on November 16th a landslip at Attadale on the Kyle of Lochalsh line blocked the railway and trapped 5342 and various items of rolling stock. An improvised service operated on the Kyle side of the blockage until March 10th 1970 when the line reopened. Also during November operations commenced in the lifting of track from the Waverley route in the Hawick area. A Class 08 shunter was noted at Hawick on November 16th and 5304 was noted two days later with a track recovery train. Class 27s at Derby Works during Christmas week were 5404/07/08/09/11/13, whilst 5414 was noted at Haymarket equipped with jumper cables. Class 26/27s were frequent visitors to Newcastle, particularly on freight workings, including Millerhill - Tyne roundtrips and a variety of Edinburgh - Kings Cross parcels. So noted was 5347 on the 21.32 Edinburgh - Kings Cross and the return 21.40 Kings Cross - Edinburgh on December 14th - 17th. On the WCML it was reported that the 21.15 Perth - Euston (date unknown) reached Crewe with 5323 providing heating with 402 as the train locomotive. Class 27s present at Derby Works during the first week of February were 5393, 5403/04/07/08/09/10/11. Conversion included the fitting of dual brake equipment and the removal of the train heating boilers from some locomotives. On January 27th (?) 5407 was noted northbound through Newcastle with a train of push-pull stock en-route from Derby to Edinburgh. By the third week of February 5409 & 5413 had returned to the Scottish Region, now equipped for push-pull working. On February 16th ex-works 5409 was noted passing Sheet Stores Junction propelling a tamper machine, which was left in a siding near Trent Junction powerbox. On March 22nd test runs began with two push-pull locomotives and five coaches between Edinburgh & Glasgow. When introduced the 46 miles between Glasgow Queen Street & Haymarket were allowed 39 minutes, although the fastest of runs managed just over 35 minutes. If one of the Swindon diesel multiple unit sets substituted an additional six to seven minutes were required. During April two test trains were in use though a shortage of Class 27s saw Class 37s filling in. Transfers at this time were minimal with several Class 27s being transferred to Haymarket as they returned from Derby Works. During May 5329 was transferred to Eastfield (65A). May 11th produced some unusual sightings north of Newcastle, 5324 worked the 18.32 Liverpool Street - Edinburgh parcels after the failure of 251 at Newcastle whilst the 6F20 Immingham - Millerhill had an unusual combination of 7590 & 5320. The new push-pull Edinburgh - Glasgow workings had produced much of interest due to the continuing shortage of properly equipped Class 27's, all substitutions requiring air braked locomotives, which were not widespread at this time. These were initially ScR Class 37's, either working with a Class 27 or with 37's at each end, so noted have been 6844 & 6936 (May 15th) and 6857 & 6844 (May 24th). Also held in reserve were several of the elderly Swindon Inter City sets, seeing occasional use with one set held at Waverley and another at Cowlairs. Outshopped from Glasgow during June were 5374 & 5387 with the yellow extended around the cabside windows. An SRPS special on June 19th encountered difficulties whilst returning from Inverness. The train had been worked up from Glasgow by 5360 & 5372, and these were used for the return. Unfortunately 5372 failed leaving Dalwhinnie, stalwart 5360 soldiered on alone over Drumochter only to expire at Dalguise. Rescue came from 5117 & 5121, fresh off the "Royal Highlander', pushing the train to Dunkeld, where further assistance appeared in the unlikely shape of 415, a class only recently cleared over this route. Travelers on the special finally reached Glasgow 160 minutes late. As the month closed out bad news was received concerning the Edinburgh - Glasgow service. The high speed running of these services, day in, day out was taking its toll on the Class 27's, now suffering from vibration affecting the motor windings. Repairs were being undertaken but Class 37's and more recently Class 25's were substituting, with 7579 so noted on June 26th. By mid July the Class 37s were temporarily removed from these services leaving the Class 25's as the regular stand in's. The Swindon InterCity sets continued to be rostered occasionally, making a creditable attempt at keeping time. However for most of these units the end was near, with over thirty in store at Millerhill. One set spent several days at Inverness for testing on the Wick & Thurso service, which they were thought to be scheduled for in September. Mercifully this was not to be. By the end of July there were no Class 27s at Derby Works. During August the 14.15 Edinburgh - Newcastle was frequently hauled by Haymarket Type 2s from Classes 24/26/27. By the middle of September 5391 was at Derby Works for the fitting of electric train heating equipment. Also during September (or late August) Class 37s had returned to the push-pull workings covering for failures. Class 37 No.6936 and Class 25s 7578 & 7581 were regular stand-ins for missing Class 27s, whilst on September 8th the 17.30 Edinburgh - Glasgow left with only 5411, but returned on the scheduled working with 6936. With the end of the summer timetable came one of the most radical changes ever witnessed to the diesel fleet. Withdrawals in October totalled over 120, coming from two distinct areas, the Western Region hydraulic fleet and the Scottish Region's NBL & Clayton fleets. These rationalizations saw the demise of the NBL built Warships, the Rolls Royce engined Claytons and the Beyer Peacock built Claytons. To cover the loss of this large number of machines an equally large number of transfers took place. As it affected the Scottish Region, the Eastern Region, that is Leeds & Gateshead, which had already sent nine Class 24's across the border in July now sent three more (5096 - 5098) to Polmadie (66A). Thornaby's Class 25/0s were transferred to either Eastfield or Leeds. Joining the Types 2's at Eastfield were thirty Class 20's mostly from the Eastern Region. The Stoke Division sent another thirteen Class 24's to Polmadie (66A), this transfer included all the remaining locomotives from the 5000 - 5019 batch and 5073. In all of these moves the Classes 26 & 27 allocations remained unchanged. Increasing coal traffic between Seafield Colliery & Cockenzie power station saw the diagrammed Class 20s supported by Classes 26 & 37. Signalling and other improvements saw sections of the Edinburgh - Glasgow route with speed limits of 100mph between Falkirk Tunnel & Polmont Junction, Croy & Falkirk High and Bishopbriggs & Gartshore. The push-pull services were allowed a maximum speed of 90mph. As the year ended withdrawals and transfers reflected the continuing rationalisation of the locomotive fleet. On the Scottish Region the last of the NBL & Clayton products were retired, though these losses did not affect the allocations of Classes 26 & 27. During January 5347 & 5348 moved from Haymarket to Eastfield, being swapped with 5380 & 5401. During February these transfers were reversed, with additionally 5410 & 5412 moving to Eastfield. 5391 still present at Derby Works during middle of March (not present by mid June). Industrial action by the coal miners seriously impacted the movement of coal, leading to many of the early series of Haymarket's Class 26s being sidelined at Haymarket during the strike. During the early hours of March 27th a series of tests took place with Class 37s and hauled stock. The first test ran from Glasgow Queen Street to Edinburgh Waverley, on arrival a Class 37 dropped on to the stock and returned west. A total of five journeys were completed, the incoming locomotive at Glasgow Queen Street assisted the eastbound working up Cowlairs bank. Timings varied between 43 and 45 minutes. Although the tests were successful the push-pull service remained in the hands of the Class 27s, which had settled down to providing a reliable, fast service over the route. The use of the Class 37s was not taken up due to increased terminal time in coupling/uncoupling the locomotives and then completing the mandatory brake tests. Released from Glasgow Works during the first quarter were 5304 & 5317 with the cab door windows removed and the replacement sheet metal painted yellow. During July 5348 moved from Haymarket to Eastfield, swapped with 5349 (this was the first transfer for 5349), whilst during the same month 5328 would become the first Class 26 withdrawn, being the only Class 26 not to be renumbered into the TOPS numbering. On September 16/17th a 'Railfair 72' open day style event was held at Eastfield, with a diesel multiple unit shuttle running from Queen Street. Included in the exibits was ex-works 5362. 5312 which had spent a year at Glasgow Works was finally released to traffic (during September? ), still in green livery with a D prefix. 5367 was noted at the Works during October with fire damage, whilst withdrawn 5328 was also present, it would be broken up during December. At Polmadie depot 5350 was noted with fire damage. During February 5329 was transferred to Inverness. On February 14th, an extremely cold day, the 07.45 Edinburgh - Glasgow Queen Street was diverted to Springburn after the driver reported having difficulties with the braking system. Investigation revealed part of the braking gear was frozen. All subsequent westbound push-pull workings stopped at Eastfield for examination prior to descending Cowlairs bank. Later that night a severe frost was partly responsible for an overhead equipment failure that led to delays for services using Glasgow Central. At the beginning of March 5391 was back at Derby Works. On March 24th 5355 became derailed by catchpoints at Polmadie, fortunately the locomotive fell away from the runnings lines, causing no delays. A week later on March 31st the 4S82 Kings Crosss - Aberdeen freightliner exchanged 187 for 5303 & 5306 in the Newcastle area. It is presumed the Type 2s then worked through to Aberdeen. The RCTS 'The Skye Sleeper Special' ran over the weekend of April 6th - 8th from Leeds to Kyle of Lochalsh. The motive power was predictable, 1111 to Edinburgh, 368 to Inverness, 5332 Inverness - Kyle - Inverness. The return was bedevilled by engineering work with 5334 & 5130 working Inverness - Perth - Larbert - Greenhill Junctions - Cowlairs - Springburn - Barrhead - Kilmarnock - Dumfries - Carlisle, 210 to Newcastle - York - Leeds. During April the first diesel locomotives started to carry the new five digit TOPS numbers, for the BRCW Type 2s these number series would include 260xx, 270xx, 271xx & 272xx. Effective May 1st the TOPS system introduced two digit depot codes, replacing the former LMSR alpha/numeric shed codes. For the Class 26/27s their depot codes became ED, HA & IS (previously 65A, 64B & 60A). Present at Derby Works during the middle of April were 5349 & 5391. During April 5327 transferred to Inverness (60A), whilst in May 5347 & 5349 moved to Eastfield (ED). An Open Day at Glasgow Works on May 12th featured about 50 locomotives on the premises, over half of which were for scrap. Amongst those awaiting entry were 5405 & 5406, both with fire damage. A week later on May 17th the Scottish Region was affected by multiple mishaps, some of a very serious nature. For the Type 2s it started in the early morning with 5308 being derailed at Burnhouse West, followed by 5375 coming into a sidelong collision with 5008 at Cadder Yard, the 13.00 Mallaing - Glasgow Queen street (presumably Class 27 hauled) failed south of Garelochead, leading to a two hour late arrival at Queen Street. Finally 5357/98 failed prior to working the 23.03 Stirling - Newton Abbot motorail, 5013 & 5096 hurridly replaced them. Other incidents this day included Classes 08/37/47/50. 5349 & 5391 were still present at Derby Works during mid-June, 5391 would quickly be renumbered 27119, and is presumably the first Class 26/27 to receive TOPS renumbering. On June 27th 27119 & 5403 were noted on the 07.30 Edinburgh - Glasgow with fitters travelling in the the cab of 27119 to monitor the new Deutz electric train heating equipment, which was to be fitted to other members of the new sub-class (27/3 later 27/2). Eventually twelve of the Edinburgh - Glasgow push-pull Class 27s were selected to have a Deutz diesel engine added to allow the coaches to be electrically heated. The diesel engine was fitted in the space vacated by the boiler, whilst the boiler water tank was replumbed for diesel fuel, thereby increasing the total fuel capacity to 970 gallons. To identify this new sub-class 27113 - 27124 were renumbered 27201 - 27112. During the conversion 27118 (5413) was found not to be suitable, so it was replaced by 27103, with 27118 then being renumbered 27103. Additionally 5409 never carried its 27/1 number, being renumbered directly to 27210. The addition of the Deutz engine/generator set saw the need to improve ventilation to the former boiler room space as a result of fires to 27201 & 27202. The bodyside window was replaced by a grille and two small bodyside grilles were added just above frame level. Late June proved to be a challenge for passengers and the operating authorities on the push-pull workings. On June 26th the 07.30 Edinburgh - Glasgow suffered the complete failure of 5399 at Lenzie, the passengers were detrained and joined a following service whilst 5386 propelled the failed train to Cadder Yard. Two days later on June 28th the 17.35 Glasgow - Edinburgh saw the leading bogie on 5387 suffer a serious failure, showering parts across the line and into nearby gardens, the parts narrowly missing a railway worker and a gardener. The train was safely brought to a stand at Falkirk High, passengers were detrained to catch following services whilst 5392 propelled the train into Polmont Loop. Finally on July 2nd the 16.30 Edinburgh - Glasgow whilst travelling at 90mph suffered the derailment of the trailing locomotive, 5400, whilst passing Cadder signalbox. The leading locomotive, 5396 and the six coaches remained on the rails, but before the train finally came to a halt the derailed 5400 had destroyed the points at the west end of Cadder Yard. Fortunately no injuries were sustained by passengers or train crew, eastbound traffic was able to pass the derailed locomotive at caution whilst westbound services were diverted through Cumbernauld until repairs were completed by the next evening. After attention at Glasgow Works 5400 would be back in traffic by August 16th. On the evening of August 6th 27119 and a rake of eight LMR dual-heated coaches were tested between Ladyburn Yard & Larkfield Carriage Sidings to test the locomotive's ETH equipment, the trials lasted for several days with 27119 confined to pilot duties at Glasgow Central during the test period. 5412 was transferred to Haymarket during August. On August 31st heavy rain in the west of Scotland led to the partial collapse of bridge No.51 at Drimsallie Lodge between Locheilside & Glennfinan. Two sets of coaching stock and locomotives 5350 & 5359 were trapped west of the collapsed span. A bus bridge was established at Glennfinnan, with the trapped locomotives and stock providing a shuttle between Mallaig & Glenfinnan. Despite pronouncements that the line would take a considerable amount of time to reopen, traffic was moving by October 31st, with full service resumed on November 1st. On September 22nd 5356 & 5348 were noted departing Blackpool with a return weekend special for Glasgow. Noted at Glasgow Works during october was 5406 with fire damage. November 2nd saw a number of Scottish Type 2s in the Newcastle area. The 3E03 19.55 Edinburgh - Kings Cross parcels arrived at Newcastle with 5403, whilst a Royal Train headed for Kings Cross was hauled by 5361 & 5365, being replaced at Newcastle by 1970. Also on this date a 'Santa Special' arrived at Glasgow Queen Street behind a festively decorated 5359 as part of a seasonal advertising promotion by a major Glasgow store. A collision occurred at Dingwall station on November 5th between the 7N31 16.20 Invergordon - Millburn Yard headed by 5330 and the 17.40 Inverness - Kyle of Lochalsh with 5329. The freight train failed to stop at the Dingwall North Jct home signal, running into the station and colliding with the standing passenger train. A number of passengers were injured, both locomotives and some coaching stock were damaged. Both locomotives would eventually be moved to Glasgow Works for repair, with 5330 being so noted receiving significant cab repairs during June 1974. 5349 was still present at Derby Works during early November. During December 5374 moved from Eastfield to Haymarket in exchange for 5412. A lightweight working for the Scottish Type 2s was the 18.55 Edinburgh - Carstairs which frequently had two locomotives for two parcels vehicles. However a later leg of the diagram was the Edinburgh portion of the 23.40 Glasgow - Bristol. On May 15th whilst working the 13.00 Edinburgh - Glasgow Queen Street service 27118 caught fire at Cadder Yard and was removed from the train. Whilst running round the train to take it forward 27101 became derailed in the down loop. The train eventually reached Glasgow Queen Street over an hour late behind 27110. Despite the occasional failures/operating challenges of the push-pull services, the services were generally maintained to a high level of on-time timekeeping. It is also apparent the the crews and station staff became very adept at keeping delays to a minimum when all but the most serious difficulties occurred. Timetable changes for the summer timetable saw a greater number of Type 4 locomotives working over the Highland to Inverness, with a consequent impact on the Inverness fleet of Type 2s. Likewise the introduction of full electric service over the WCML between Euston & Glasgow saw a decrease in the number of visiting diesel locomotives that might be borrowed for Scottish fill-in turns. During mid-June 5351 & 27107 were noted at Glasgow Works with fire damage. A Royal Train working took place on July 3rd with 27043 hauling an Edinburgh - Bishopston Royal working comprised of four standard BR coaches and Saloon 396. During the late afternoon of August 2nd a Crianlarich Lower - Corpach freight derailed several timber wagons between Bridge of Orchy & Rannoch. Considerable damage was caused to the track, with the line not being opened until noon of the next day. 27002 was hauling the train and remained on the rails. August 28th proved to be a challenge for the operating authories on the West Highland when 27014 failed near Morar with an afternoon Mallaig - Glasgow. An approaching Glasgow - Mallaig service was stopped and its locomotive 27023, was removed and dragged the failed train to Arisaig, where 27009 had been sent from Fort William to rescue the eastbound service. 27009 had to be refuelled at Fort William prior to taking the eastbound service forward, but then failed whilst restarting from Bridge of Orchy. 27040 was taken off a westbound service and added to an eastbound freight prior to relieving 27009. Arrival at Queen Street was shortly after 11pm, a nine hour journey for anyone who endured the adventure. Just before 7am on September 14th, whilst working an LNER Charter from Euston to Wick/Thurso with 26035, 26034 suffered two failed traction motors shortly after cresting Slochd Summit. Inverness sent out 24129 & 26033 to assist the failure, with arrival in Inverness being three hours behind schedule. This simple failure led to a miserable day for operating authorities in the Inverness area, compounded by the abundance of single track with crossing loops, several long distance extras, tight connections, tight diagramming of rolling stock with the knock-on effect of late arrivals creating late departures for other services. Services were affected on the Highland mainline and the Wick/Thurso, Kyle & Aberdeen lines out of Inverness. Mercifully no other locomotive failures were recorded in the Inverness area this day. Another derailment involving a freight hauled by a Class 27 occurred on the late afternoon of September 19th when three wagons in a freight hauled by 27019 became derailed leaving Cadder Yard blocking both main lines. The line remained blocked for the rest of the day, causing considerable operating difficulties for several passenger trains immediately impacted by the derailment. 27027 was noted at Glasgow Works in early October with collision damage to a cab. This may have been as a result of a lorry striking the 17.29 Mallaig - Fort William at Annat on August 19th. During October (date unknown) 27012 was noted at Largs with a McAlpine special train from Glasgow, comprised of six coaches including two preserved Gresley coaches and the Caledonian observation car. On November 7th 27004 & 27107 hauled the Royal Train from Dundee to Edinburgh with HRH The Duke of Edinburgh on board. A number of the Inverness - Aberdeen services utilised hauled stock and locomotives, with Inverness Class 26s occasionally handling the services. On February 17th the 16.30 Edinburgh - Glasgow Queen Street suffered a broken axle on the trailing bogie of coach SC5189, which eventually derailed at 90mph whilst passing Cadder East. SC5189 was the last coach in the train and buffer locked with 27202 which then derailed its leading bogie. The train was safely brought to a halt by 27107, but two miles of track had been damaged. Fortunately no injuries were reported as the coaches remained upright. During the first week of March 27005 was noted at Polmadie with collision damage to one side. T.S.S.A action seriously impacted service levels on the push-pull services during March, with reduced coaching sets and frequently running with only one locomotive. Unusual motive power frequently substituted for the Class 27s. 27024 became the last Class 27 in green livery, being repainted in April/May. Noted at Glasgow Works Open Day on May 17th was 26005 with collision damage. On May 31st through Kings Cross passengers on the 17.25 Fort William - Edinburgh, connectiong with the 19.45 Aberdeen - Kings Cross could have travelled half way round the world by the time Kings Cross had been reached. The twelve coach train departed Fort William with 27009 & 27039, these were removed from the train at Tulloch and returned to Fort William depot after it was established only one locomotive was functioning properly. 27112 & 27024 were obtained and returned to the train at Tulloch, finally arriving at Glasgow Queen Street at half past midnight. Falkirk & Edinburgh passengers were taken forward by a special diesel multiple unit from the High Level station. The train then proceeded to Cowlairs where the two Class 27s & several coaches were removed and 27004 coupled to the train which it worked via Mossend to Carlisle. Here 31411 took over as the 02.50 to Newcastle, which departed over an hour late. After a refreshment break at Newcastle the train departed as the 06.05 special to Kings Cross, arriving in the capital at noon, after a journey time of over eighteen hours. The continued use of Class 40s over the Highland mainline on internal passenger workings was impacting timekeeping due to their lower horsepower than a pair of Type 2s. Frequently Class 40s from non-Scottish depots have been used. During July 27012 was placed in store. On July 12th a relief morning Aberdeen - Glasgow was stopped near Carmont with 27009 on fire. After fireman extinguished the fire, 47158 off the down Night Aberdonian was removed from its train to assist, but in using the crossover at Carmont became completely derailed. The line was blocked until the late afternoon with a bus bridge established between Stonehaven & Montrose. The Scottish Region's Class 24 fleet was drastically reduced by withdrawals and storage during August (leaving Eastfield with no Class 24s), these losses were covered by transfers of Class 25s, leaving the Class 26/27 allocations unchanged. The Inverness - Aberdeen service again suffered from diesel multiple unit shortages during the summer. Substitution involved hauled stock and various motive power including Classes 26/27. During September 27012 was returned to traffic to Eastfield depot, at the same time 27039 was placed to store. The Crewe Works Open Day on September 20th found 27006 & 27025 present, the former with fire damage. 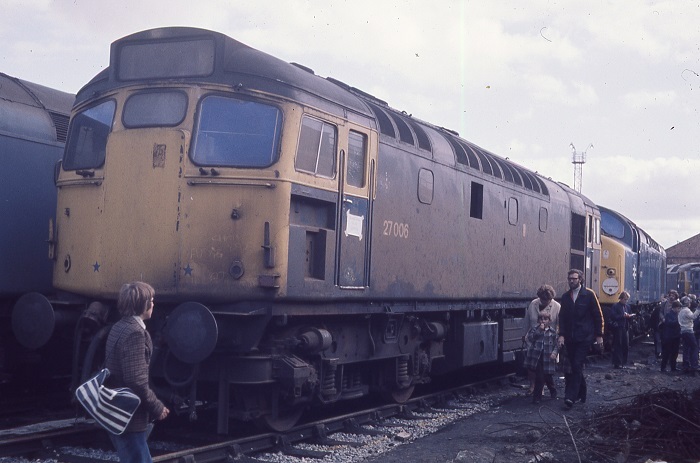 A surprise visitor in the yard at Crewe Works Open Day on September 20th 1975 was a work-stained 27006. The locomotive still carries the tablet catcher recesses. There appears to be some metal reinforcing added above the driver's side window, the windscreen wipers are missing and when the cab-front gangway doors were sheeted over the beading was not replaced. During October 26016 & 27039 were withdrawn, the first renumbered Class 26 & 27 to suffer this fate. Transferred to Inverness at the same time were 26015/21/23/36. By the middle of October fire damaged 27006 was at Glasgow Works, as was fire damaged 27009. The winter timetable saw the loss of the 17.10 Edinburgh - Newcastle, a favourite for varied motive power including Classes 26/27. The service would now only run to Berwick-upon-Tweed, but would continue to see a vast array of locomotive types handle the turn. During November serious problems affected the high-speed Edinburgh - Glasgow services, with many of the dedicated coaching sets being taken out of service due to problems with the braking equipment. Replacements featured diesel multiple units and locomotive hauled Mk.1 stock. A further nine Class 26s were transferred to Inverness during November, leaving only 26001 - 26007 at Haymarket, although they were most frequently found laying over at Millerhill. Additionally the ongoing shortage of diesel multiple units frequently found these Class 26s substituting on local passenger services. The 1E83 17.10 Edinburgh - Berwick upon Tweed continued to see a variety of motive power, including a mixture of Class 27s. 27025 was still present at Crewe Works during early December, but had disappeared by the third week of January 1976. On December 29th the heavy 20.50 Euston - Inverness 'Royal Highlander' suffered brake trouble and was unable to stop at Larbert, the train ran through red signals at Alloa Junction and was finally stopped on the rising grade at Plean. A small fire caused by sparks from the brakes occurred under the trailing Type 2. An inquiry revealed the coupling of the Type 2s at Mossend had left the brakes improperly secured. Possibly as a result of the stress of the runaway incident the driver died shortly afterwards. Dual-brake equipped during 1975: 27041 (August). ETH equipped & boiler removed during 1975: 27212 (March); 27204 (April); 27208 (December). The year was not even a month old when 27006 was retired, having been allocated only to Eastfield throughout its career. On January 7th the early morning Millburn Yard - Stromeferry freight was loaded to over 750 tons due to a large consist of Presflo wagons, being hauled by 26024 & 26021. Two merry-go-round trains at Cockenzie Power Station collided on January 30th, with 26003 & 20179 derailed along with some wagons. During the first week of March 27022 was noted at Glasgow Works with collision damage. Photograph collection of webmaster Its March 13th 1976 as an unidentified Class 25 and 27038 undergo repair at Glasgow Works. Whilst undergoing repair 27038 would receive dual braking equipment. In the foreground are a variety of parts awaiting overhaul and return to the locomotives. Noted at Derby Works at the beginning of May was 27207. On May 2nd 26046 was noted at Berwick hauling 24015/16/71 & 24117 as an Eastfield - Doncaster scrap locomotive movement. Inverness allocated 26009 worked May 5th’s 17.10 Edinburgh – Berwick service. Late on the evening of July 1st 27013 ran away at Eastfield depot, running off the headshunt, causing debris to fall onto the mainline. The damage to 27013 (approx GBP12,500) led to its immediate withdrawal. 27013 was always allocated to Eastfield. During early August 27022 was noted at Glasgow Works with collision damage. On August 26th the prototype Class 314 No.920001 was moved from Glasgow (Hyndland?) to Ilford with 26007 working this special as far as Newcastle, 37167 taking over here. Heavy rain in the late afternoon of September 28th caused numerous problems throughout the Glasgow area. Glasgow Queen Street suffered high water levels and sustained considerable damage. Amongst the rolling stock trapped in the station was a push-pull set with its Class 27s, three other Class 27s and other assorted rolling stock. Early on the morning of September 11th 26025 became derailed and fell on its side near the fuelling point at Perth. The Dundee breakdown crane with 25062 attended in the rerailing process. On September 23rd 26037 worked a Millerhill - Tyne and Tyne - Millerhill freight. Withdrawn during September was 27035, whilst at Glasgow Works 26016 was finally broken up, although the cabs lingered for a while. Commencing November one of the push-pull sets was taken out of service to permit a ten-day overhaul at Glasgow Works. A Mark I set with Type 4 haulage substituted with the remaining push-pull diagrams adjusted creating more intensive utilisation. It was expected to take six weeks to rotate all the push-pull sets through the Works. The end of December saw the end of the usage of Class 24s in Scotland, bringing to an end the long time partnership of the Derby & BRCW Type 2s in Scotland, particularly at Inverness & Haymarket depots. The Class 24s did not go out quietly, with many of the few remaining operational members in frontline service, both passenger & freight. On November 23rd the 15.10 Aberdeen - Glasgow with 27011 failed south of Usan, assisted came in the shape of 24115, which on December 4th with 26043 worked the Edinburgh - Carstairs leg of an excursion to Euston. Placed into store during December was 26020. ETH equipped during 1976: 27211 (March) - the last to be converted. During January 26009 & 27015 were placed into store and then withdrawn later during the month. 27015 was only ever allocated to Eastfield. 26020 which had been placed to store during December 1976 was also withdrawn during January. 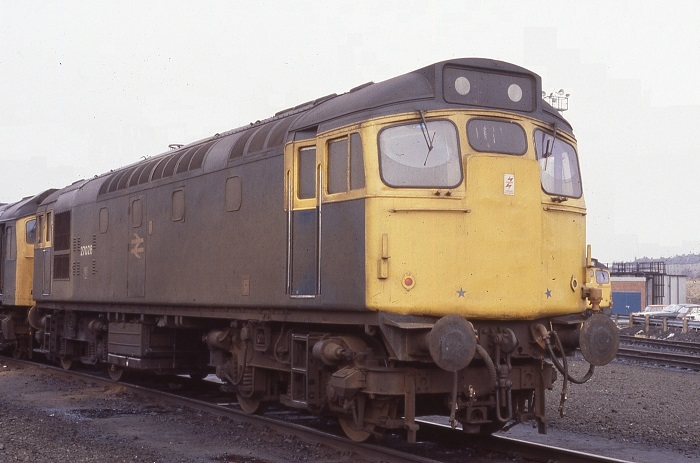 With the withdrawal of the Scottish Class 24s completed by the end of December 1976 and with a continued surplus of Type 2s, the reduction in the diesel fleet would see further inroads into Classes 25/26/27, with those example due shopping or with collision/fire damage becoming targets for early withdrawal. Date January?? whilst waiting to depart with the 17.08 Glasgow Queen Street - Edinburgh 27201 caught fire and was removed. 27112 took the train forward alone but was declared a failure at Linlithgow where the service was terminated. Withdrawn 27015 reached Glasgow Works on February 24th and had been broken up there by the third week of April. On March 16th a special Crianlarich - Fort William freight headed by 27031 saw eight wagons of coke become derailed west of Bridge of Orchy. Major disruption ensued as the line was not reopened unitl March 18th. Over the same route it was reported that the passenger schedules were now slower due to the alleged inferior maintenance carried out on the Class 27s. On occasion Inverness based Class 26s could be found working over the West Highland routes. The 23.54 Millerhill - Mossend of April 19th led by 26005 & 26006 ran into a van which had fallen on to the rails near Cleland station. Attempts by the driver to contact authorities failed leading to two occupants being killed with several others injured. 26020 was still stored at Inverness during early June, at the same time condemned 26009 & 27013 were still present at Glasgow Works. On June 21st whilst propelling wagons into the BAC works at Fort William, the train was directed into the wrong siding, derailing six wagons and demolishing a building. 27038 was undamaged in the incident and was able to remove the undamaged wagons. A number of Edinburgh - Aberdeen & Edinburgh - Inverness services during late spring & summer continued to see occasional haulage by pairs of Inverness allocated Class 26s instead of Class 40/47s. Elsewhere Class 26s could be found on Glasgow Queen Street - Oban services, an example being 26024 on the 08.35 Glasgow Queen Street - Oban on August 24th. In the Edinburgh area a new coal handling facility opened at Leith Docks. Haymarket's slow speed control equipped Class 26s, along with similarly equipped Class 20s service the facility. From time to time the SSC equipped Class 26s strayed on to other duties, on June 1st 26007 worked the 17.10 Edinburgh - Berwick-upon-Tweed. 26020 was noted at Glasgow Works for scrapping during early August. During the same month 26017 was placed to store, being noted at Glasgow Works in late September. The winter timetable saw the abolishing of 1st Class accommodation on Scottish Region diesel multiple units with the exception of those serving Inverness. To maintain 1st Class on the Edinburgh - Kirkcaldy - Perth service a locomotive hauled set using a Type 2 was diagrammed. The Glasgow Queen Street 'Santa Special' occurred on November 4th with a suitably decorated 27012. A damaged jumper cable on the Corridor First coach on November 17th's 17.10 Glasgow Queen Street - Edinburgh brought the train to a halt with 27111 & 27202, 37148 was sent to assist but initially had difficulty in releasing the brakes, the service was terminated at Falkirk High, passengers eventually reached Edinburgh over two hours late. The night of January 28th brough gales and blizzards to the Highland Region, reportedly the worst since 1955. This led to all sorts of issues for the services out of Inverness. During January two boiler equipped Class 37s (37108 & 37111), transferred from the Eastern Region were utilised on the West Highland services, in the hope of improving timekeeping. Amongst many changes revealed for Scottish Region services would be the introduction of MkIII stock and push-pull equipped Class 47s for the Edinburgh - Glasgow services, scheduled for May 1979, with the existing locomotives and stock transferred to the Glasgow - Dundee route. During the last two years four extra minutes was added to the push-pull schedules. Starting in late February for about 30 days one push-pull set was removed daily for maintenance purposes. In replacement conventional stock was substituted with one locomotive for haulage. The remaining four diagrams were adjusted to cover missing parts of the fifth's diagram. However things did not go smoothly due to ASLEF members objecting to the alledged poor standard of maintenance on the Classes 27/1 & 27/2. Many cancellations ensued as ASLEF drivers failed locomotives considered defective, whilst the NUR maintance staff at Haymarket threatened action following the ASLEF slur on their work. Whilst standing at the buffer stops at Glasgow Queen Street on March 15th 27040 came into heavy contact with the stock for a Fort William service after locomotives adding a van at the east of the platform came into heavy contact with the stock, pushing the stock down the platform. 27040 suffered minor damage. The use of vacuum braked stock on the 16.50 Glasgow Queen Street - Edinburgh saw some less than expected locomotives taking up the service, including Inverness allocated 26018 on April 4th and 26021 on April 17th. The 23.20 Glasgow/Edinburgh - Inverness of April 18th failed at Stanley Junction behind 26024. In reversing on to the track double section, in order to allow the rescuing locomotive from Perth to reach the front of the train, 26024 and the two leading coaches became completely derailed. With the line blocked buses provided a link between Perth & Dunkeld for the overnight services. On April 25th 27004 and saloon DM45020 were used to convey the Chairman of the B.R.B., Peter Parker over the newly reinstated section of double track between Blair Atholl & Dalwhinnie. The special proceeded to Inverness & Aberdeen. Noted at Glasgow Works at the beginning of June was 27103 with minor collision damage. On June 3rd an overnight excursion from Lincoln to Fort William encountered considerable problems after exchanging locomotive at Cowlairs, 47218 for 25062 & 25230. The Class 25s got no further than Dumbarton Central, where after the early morning service to Mallaig passed, 25246 & 27029 replaced the Class 25s. The run up Glen Falloch took its toll on 25246 which was replaced at Crianlarich by 25232 after allowing a Glasgow bound service to clear. Arrival at Fort William was over two hours late. For the return trip the health of 25232 & 27029 was checked at Fort William and they were allocated to the return working. However 25232 failed at Corrour and was removed. One wonders what thoughts crossed the minds of the train crew and the traction inspector as 27029 now continued on alone across the desolate & lonely Rannoch Moor to Bridge of Orchy, where 27043 was added. No more challenges were encountered, some time was gained to Cowlairs where 47218 was waiting to take over. On July 22nd 26004 & 26007 reached Newcastle with a Grangemouth - Haverton Hill tank train, the Class 26s returned north on the overnight Kings Cross - Aberdeen freightliner. An incorrectly set set of points at Cowlairs led to the collision of two sets of coaching stock on July 26th. As well as damaged stock and a damaged wall in the carriage cleaning set, push-pull equipped 27108 suffered minor damage to the cab front. The first Class 47 destined for the revamped Edinburgh - Glasgow service was called to Crewe Works for conversion, with 47493 being noted there in late June. By August Derby Carriage & Wagon Works were involved in the conversion of MK III, coaches and Glasgow Works were working on the conversion of the first driving trailer. During August 27031 was withdrawn. For the last three months of the year the push-pull services were rerouted via Falkirk (Grahamston) to allow for the upgrading of the tunnel at Falkirk (High) to permit 90mph running, with work commencing on October 2nd. During October 26008/10/11/12 were transferred to Haymarket. On October 13th - 15th an LGCB railtour ran from Crewe to Wick/Thurso. For the portion north of Inverness 26024 & 26036 did the honours, however somewhere on the trip 26036 developed a traction motor fault so for the return journey to Inverness 26024 & 26018 were used. Whilst the Class 26s did what was expected of them, the true workhorse of the railtour was 47001. The trip started at Crewe with 47001 and eleven coaches headed for Leeds where six sleeping coaches were added. The Class 47 ran round its train and headed out over the Settle & Carlisle, then over Beattock, refuelled at Perth and on over the Highland mainline to Inverness. On the return south 47001 took the railtour via Perth, Edinburgh, Carstairs, Carlisle, Newcastle, York, Selby & Leeds, where after its magnificent effort it was replaced ny no-heat 40006. Events during November did not shine too brightly on the Class 27 powered push-pull services. On November 1st late running of a mid-afternoon eastbound service saw its return working cancelled and delays to two other services. On November 18th the 08.15 Edinburgh - Glasgow Queen Street with 27102 & 27202 failed at Polmont, at about the same time an eastbound service failed at Falkirk Grahamston, the ensuing delays were extensive. Three days later (21st) 27103 with a scratch set of coaches required assistance up Cowlairs Bank due to poor adhesion as a result of wet weather. This resulted in delays to an eastbound push-pull service. The last two days of November saw a Class 26 with two coaches and saloon SC45030 working over the Inverness - Wick route, calling at all stations and authorised to operate at higher than normal speed limits. Four specials ran on December 9th between Glasgow & Edinburgh in support of the All Blacks rugby game at Murrayfield, one Class 25 and three Class 27s hauled the services. Christmas week saw an overcrowded Aberdeen - Kings Cross HST service on the morning of the 21st require a following relief service with 26024 working through to Newcastle, then returning with an afternoon relief to Edinburgh. Withdrawn in 1978: 27031 (May). Scrapped during 1978: 26009 (February), 26017 (February), 26020 (March), 27031 (August). It was a slow northbound journey for 27029 on January 12th having taken over a Tyne - St Rollox movement at Berwick comprised of two Class 08 shunters (08170 & 08511). By the end of January the first of the Class 47/7 locomotives had been released from Crewe Works, being noted on various workings in the Edinburgh area, such as to Carstairs and Aberdeen, including many empty coaching stock workings. 27201 was withdrawn from Haymarket during January due to fire damage. It would spend some time stored at Polmadie prior to being moved to Glasgow Works on May 22nd. Bad weather on February 17th, including snow & gale force winds saw the police in the Dalwhinnie area transfer stranded motorists from the A9 to an evening Edinburgh - Inverness service hauled by 26039. Despite only one locomotive allocated to the train, Inverness was reached but time had been lost. On February 25th 27019 worked an Aviemore - Newcastle special, returning north with the 20.00 Kings Cross - Aberdeen. 27026 at Eastfield on Februry 24th 1979. Although rostered for an Eastfield Class 47, the 17.35 Edinburgh - Inverness was frequently worked by pairs of Inverness Class 26s, being so noted on March 29th & 30th, April 2nd, 6th & 9th. 27033 was noted at Glasgow Works during late April with severe fire damage to one cab. On June 2nd 26025 was noted in charge of an Ayr - Newcastle day excursion. Glasgow Works began applying large numbers to outshopped locomotives during June/July, early examples with this were 26011 & 27034. During early August 47704 and a rake of coaches began sporadic tests on the Edinburgh - Glasgow route. At the time Glasgow Works held many of the recently converted driving brake coaches (DBSO 9701 - 9710) whilst many coaches intended for the push-pull service were in use on the temporary Edinburgh - Euston service pending reopening of the ECML through Penmanshiel. Despite the proliferation of Class 47s in Scotland, pairs of Class 26s were still diagrammed from time to time on passenger services from Edinburgh to Aberdeen & Inverness. Additionally on August 31st the 20.35 Aberdeen - Kings Cross was worked to Newcastle by 26014 & 26031, returning north with the 23.15 Kings Cross - Edinburgh. The LGCB West Highland No.4 railtour from Liverpool on September 28th - 30th used 27109 & 27110 from Cowlairs to Oban, Crianlarich & Fort William. Here 25241 & 25078 took ten of the coaches to Mallaig and back. For the return to Cowlairs 27109 & 27040 were used, 27110 had been failed earlier in the day at Fort William. After nine years on the Edinburgh - Glasgow push-pull service the Class 27/1 & 27/2 were gradually replaced by Class 47/7s, with the first of the new push-pull trains entering service during October, with full conversion expected by the end of November. The opportunity to use the ETH equipped locomotives on other Scottish services was not taken up, with the equipment being removed over time. The former push-pull locomotives were to be renumbered 27045 - 27056 (ex 27/1s) and 27057 - 27066 (ex 27/2s), however 27203 was withdrawn prior to renumbering and 27206/07/08 were never renumbered. During early November three pairs of Class 27s remained in service on the push-pull services. Pairs of Class 26s continued to work Highland services with 26034 & 26011 noted on November 21st with an Inverness - Edinburgh, the next day (22nd) 26026 & 26032, whilst on 24th the same pair worked an Edinburgh - Aberdeen and 26044 & 26027 on December 13th. 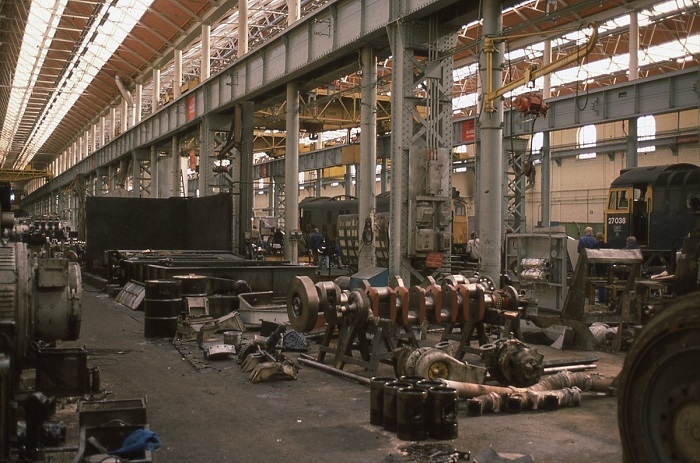 As result of motive power shortages during the year caused increasing challenges in maintaining the timetabled services, an offshoot of this was the publishing of lists revealing those locomotives overdue classified repairs. In many cases the affected locomotives were awaiting unscheduled repairs due to accident or fire damage. For the Scottish Region's Class 26/27s the situation was minimal, as at the end of the year only 27002 due November for a General & 26034 due December for an Intermediate were overdue. (The allocations remained the same as for the year-end 1978 apart from the withdrawal of 27201 from Haymarket). Page added January 2nd 2015.